This time, there was no need for Leon Lett to try and make a play on a missed field goal. 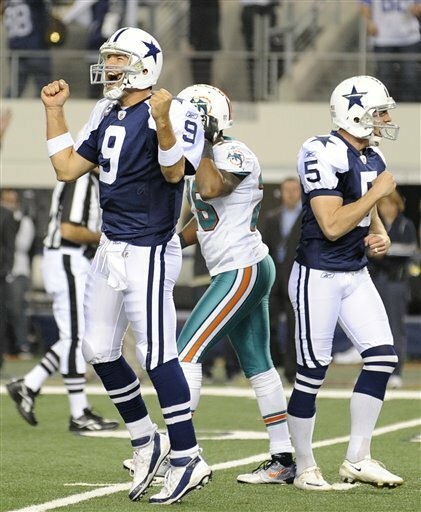 Ridding themselves of the demons of the Thanksgiving Day loss from 18 years ago, the Cowboys this time got the game-winning field goal at the buzzer, topping the Miami Dolphins 20-19. Dan Bailey nailed the 28-yard game-winner as time expired to lift the Cowboys to their 7th win against four losses. 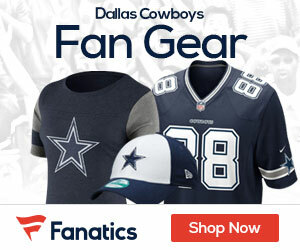 Dallas has won four games in row and sits a half-game ahead of the New York Giants for first place in the NFC East. Tony Romo overcame a pair of first-quarter interceptions to throw two touchdown passes to Laurent Robinson for the Cowboys, who trailed 19-17 heading into the final drive. Romo, who improved to 5-0 on the holiday as a starting quarterback, completed 22-of-34 tosses for 226 yards. Matt Moore finished with 288 yards and one touchdown on 19-of-32 passing for the Dolphins (3-8), who were looking to win four games in a row for the first time since closing the 2008 season with five consecutive victories. Miami opened the second half with a time-consuming drive, but wound up settling for a Shayne Graham 27-yard field goal. The Dolphins found the end zone on their next possession after a Dallas punt. Moore converted a crucial third-and-13 from his own 23-yard line with a 41- yard completion to Brian Hartline. Two plays later, Brandon Marshall caught a 35-yard TD pass with Dallas cornerback Terence Newman draped around him to put the Dolphins up 16-10 with 3:54 to play in the third quarter. The Cowboys regained the lead on its next drive, one that featured Romo completing a pass on three different occasions while on the verge of being sacked. On the second play of the fourth quarter, Romo hit a streaking Robinson in stride in the back of the end zone for an 18-yard touchdown. Miami then put together another minute-munching drive after it appeared they were going to punt. The Dolphins were stopped on third-and-4 from their own 38, but an illegal contact penalty negated a sack and moved the chains. Davone Bess made a one-handed grab over the middle for a 24-yard gain on third-and-10, setting the Dolphins up at the Dallas 33. Miami marched to the three, but Moore threw behind Hartline, who had the ball glance off his fingertips, on third down. The Dolphins went back on top at 19-17 when Graham drilled a 23-yarder with 7:14 to play. After the teams exchanged punts, the Cowboys got the ball back with 2:59 remaining. Beginning from his own 36, Romo hooked up with Jason Witten for a 23-yard catch-and-run. After another short toss to Witten, Romo consistently handed the ball off to DeMarco Murray, whose multiple runs set up Bailey for the game-winning kick. The Dolphins picked off Romo two times in the first quarter, but produced only a 26-yard Graham field goal. After Graham missed a 47-yarder wide left, Bailey was good from 32 yards to tie the game with 4:38 left in the second quarter. Moore mishandled a snap late in the first half and DeMarcus Ware recovered the fumble for Dallas at the Miami five-yard line. The turnover led to a Robinson touchdown. Graham then made a 28-yard attempt to trim Miami’s deficit to 10-6 at the break.